See the town glistening in the rain.Experience Kanazawa at night on the Light-up Bus. 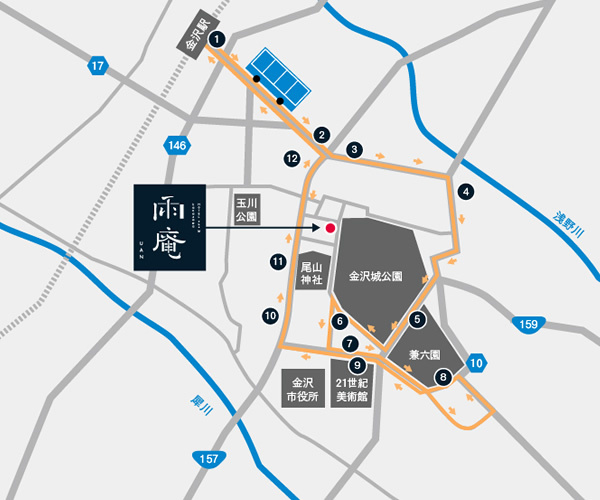 Kanazawa has fascinating spots spread out over a wide area of the city, so the bus is a necessity for tourists. If you use the One Day Pass issued by Hokutetsu Bus, you can access most of the sights in the city for just 500 yen (250 yen for elementary school age children). If you want to enjoy Kanazawa on an even deeper level, we recommend the Kanazawa Light-up Bus, which runs on Saturday nights. This bus travels around places which are illuminated, allowing you to enjoy the beautiful night scenery. If you purchase the Unlimited Ride Pass, you can get on and off the bus freely at places where you wish to enjoy the scenery. The pass costs just 500 yen. On rainy days, the city sparkles even more than usual, as the light is reflected in the raindrops. 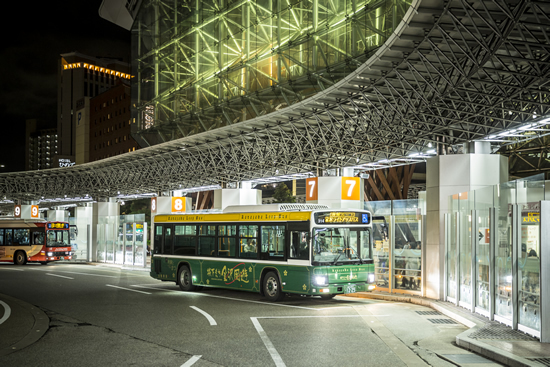 We highly recommend you take this special bus ride around the sights of Kanazawa. 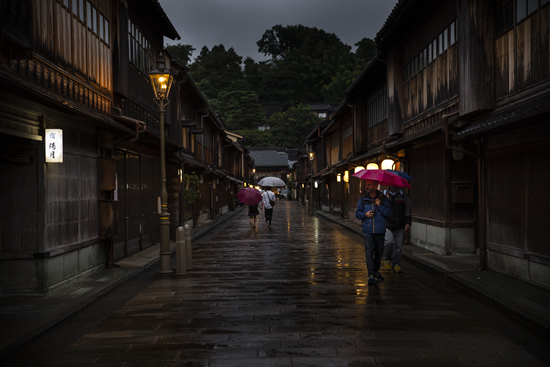 During the daytime, Kanazawa’s Chaya district bustles with tourists, but it quietens down at night. The light from the refined street lamps and buildings is captivating. 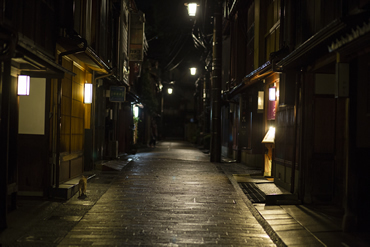 Stroll through the beautiful streets lined with latticed bay windows while listening to the sound of a shamisen being played somewhere, and you feel as if you have traveled back in time. On rainy days, the wet stone pavement glistens as it reflects the light and creates a scene more beautiful than usual. Ume-no-hashi Bridge spans the Asano River, and is close to the Higashi Chaya district. 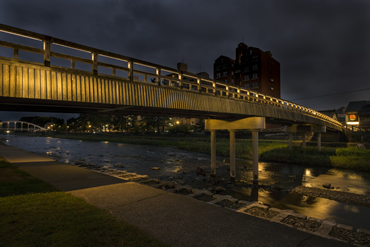 This bridge, which was the setting for novel The Righteous and the Chivalrous by Kyoka Izumi, is one of Kanazawa’s scenic night spots. 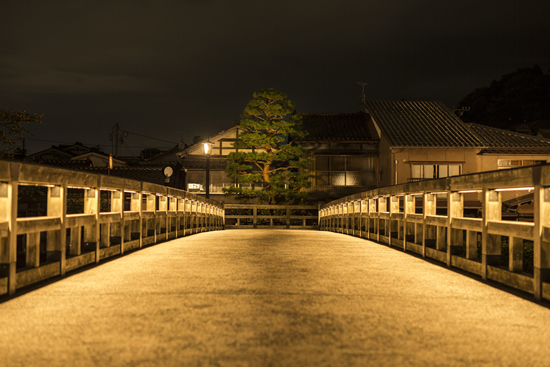 The LED lights are installed on the part which hides the beams, so as not to spoil the elegance of the wooden bridge, and they light up the river at night. Vehicles cannot use the bridge, so it is the perfect place in which to place a tripod and take some shots of the night scenery. 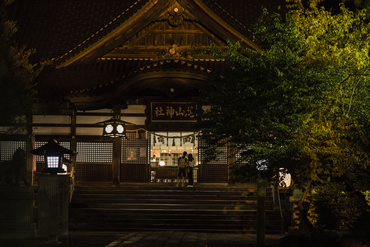 Oyama Shrine was built in 1873 to enshrine Toshiie Maeda, the founder of the Kaga Domain, and his legal wife O-Matsu-no-kata. 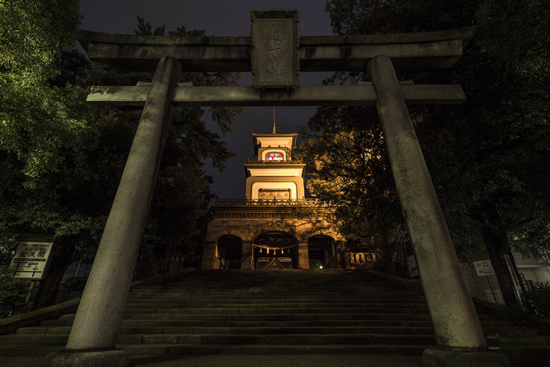 The main highlight of the shrine is the three-tiered gate which incorporates Japanese, Chinese and Western styles. The stained glass on the top tier is illuminated at night, and creates a magical atmosphere. The shrine is close to Uan, so it makes a good starting or finishing point for your night tour.